Onkyo and 7digital to launch high-res music store in Europe and US | What Hi-Fi? 7digital and Onkyo have announced that the successful e-onkyo high-resolution music store is set to launch in Europe and the US. E-onkyo music offers in the region of 60,000 tracks for download in Japan, around 25 per cent of which are available in high-resolution formats. It is claimed to be "the most successful high-definition digital music store in Japan". Now it appears the service will become part of the 7digital download store, with the roll out of higher resolution music set to begin in the "coming months". 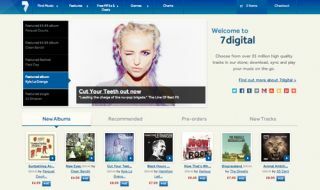 Ben Drury, co-founder and chief strategy officer, 7digital, said: "With the introduction of our HD digital music portfolio we hope to reconfirm 7digital's position as a leader in high-quality digital music services. "There is a global demand for higher-definition digital music and it’s exciting to have such an internationally recognised and respected industry brand as Onkyo as our first major partner in this space." The Japanese e-onkyo music site offers PCM files right up to 24-bit/192kHz as well as DSD64 and DSD128 tracks. 7digital already carries a limited number of 16-bit FLAC albums for download, but it looks like this section will be rapidly boosted in size thanks to the Onkyo partnership. Shinsuke Yamashita, president, Onkyo Entertainment Technology Corporation, said: “We feel strongly that consumers deserve to hear their favourite music in clear, clean and crisp sound. "Our e-onkyo music service launched in 2005 in Japan and we are now delighted to bring the successful service to consumers in Europe and the US." High-resolution audio has received plenty of attention, thanks to the addition of high-res support to phones such as the LG G2, LG G3 and Samsung Galaxy Note 3. Neil Young's PonoMusic service raised millions on Kickstarter to launch a high-res music store and portable music player, while HDtracks, the US downloads store, is still promising to launch in the UK some time soon.